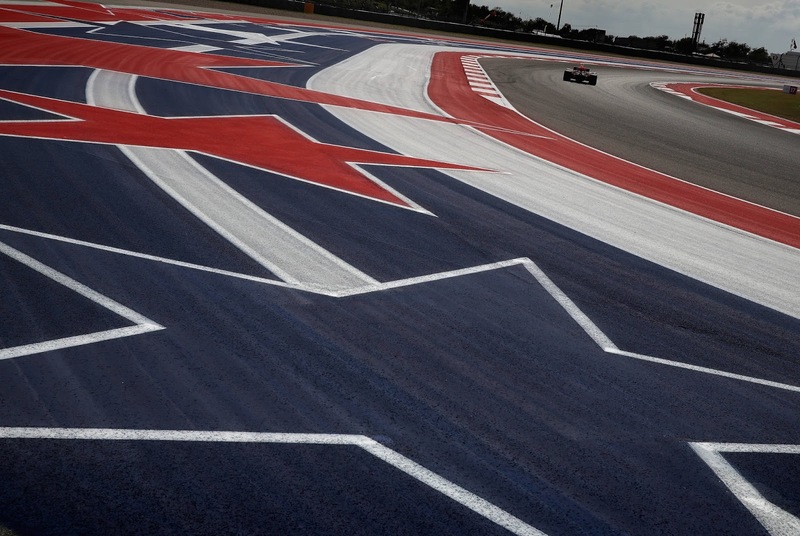 They call it the devil's wind in Texas, and it was howling through the paddock after a massive thunderstorm, strong enough to wake the sleepiest of jet lagged telly commentators snug in their hotel beds, rocked through the Austin area mere hours before the start of the race. Actually, they don't really call it that in Texas, but they should because HOW AWESOME WOULD THAT BE!! Nevermind, the reality is that with gusts of up to 45 kph, the shark-finned prima donnas of F1 were going to have their hands full, as Daniel Ricciardo demonstrated yesterday, having to bail on a lap thanks to an inopportune gust. And don't even get me started on HAAS, which seems excessively temperamental in exactly the sorts of conditions facing the teams today. Penalties, more than a few, today. Start with Vandoorne, getting a new engine thanks to a suspicious fire up. Verstappen as well and of course Hartley. Not to mention Hulkenberg and then the duo of Stroll and Magnussen for various bits of naughtiness during qualifying. Pirelli tyre strategy argued a 2 stopper all the way, with Ultra-Ultra-Super being the preferred option. Given low degradation, they allowed as how a 1 stopper might be OK but it should be interesting to watch how that plays out. Also entertaining was a bit of whining by Cyril Abiteboul, as it turned out that Mercedes, unlike say the FIA, tended to lock up their high value personnel with excessively long gardening leaves. Sauce for the goose and all that but the real vocal brilliance was the pre race announcing by famed boxing announcer Micheal Buffer, who borrowed "Gentleman, start your engines!!" from Indy, as Liberty was looking to showcase the showbiz they are planning to bring to the sport worldwide. Lights Out!!!! It was a banging start by Vettel a Hamilton can't close door and the Ferrari claims first out of T1. Ocon too had a magnificent launch and was up to P5 ahead of Raikkonen, less than good news for Perez. Alonso in front of Sainz as well as the first lap rapidly ticked over. Ricciardo was applying pressure and in the second lap he made his move into T1. 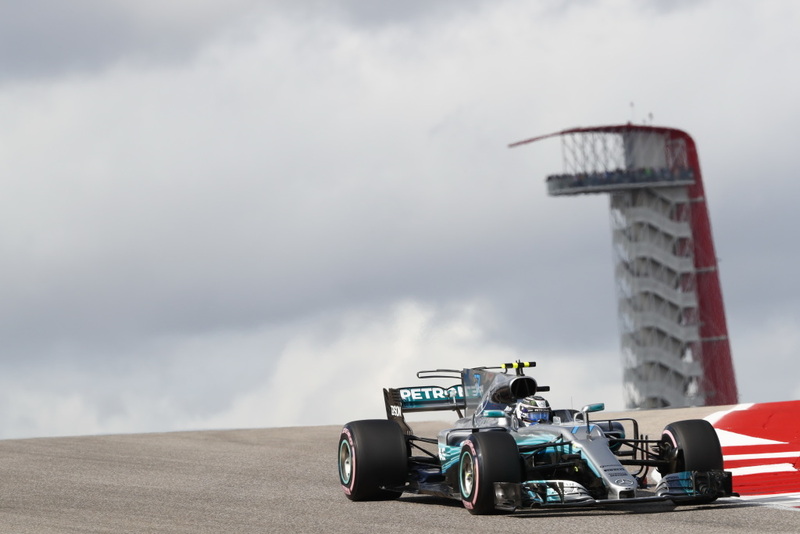 Bottas refused to yield and in a replay of much of their junior careers the battle continued, into T2 and T3 before finally Valterri prevailed and Danny Ric backed off to bide his time for another go. Verstappen from the back was already up to a rather astonishing P11 while Raikkonen had undone the damage of his start, getting back round Ocon to take P5. 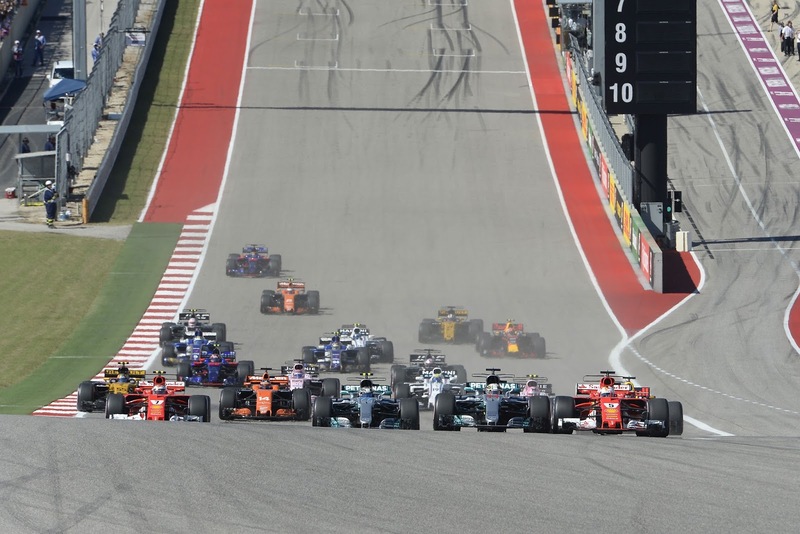 At the front, Hamilton loitered a second off the keel of Vettel, clearly itching to make a move and retake the lead of the race. Discretion, valor and tyres kept him menacingly close for the moment. Lap 4 and again Ricciardo was on the attack through T1, and again Bottas was able to defend, but at the expense of losing massive chunks of time to the leading duo, nearly a second lap. Ricciardo's second go was up the inside and he was unable to get the car stopped quickly enough, going wide and allowing Bottas to get back inside and maintain his position. 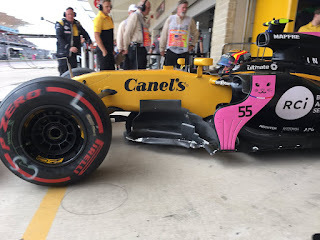 Hulkenberg called it a day on lap 5, depriving us of what should have been an excellent marker for Carlos Sainz. And possibly does provide a marker for Renault, who was running some updates on his engine. Up to the lead and Lewis, quite happy with his pace on the radio, was closing in and as lap 6 unfolded, he took maximum advantage of DRS and was wheel to wheel with Vettel. Up the inside at the end of the straight and he held the lead with Vettel trying to fight back with different lines, showing Hamilton his front wing but to no avail as they streaked up to T1 and the start of the seventh lap. Speaking of 7's, Verstappen having kept his foot well in it was up to P7, by Alonso like he was peddling a bike. Magnussen was in and out of the pits with an early change thanks to a racing incident with Wehrlein. Less fortunate was Wehrlein, day done with suspension damage from the contact. Two laps more and Hartley was in for TR, back out on the Supers and at the tail of the field. 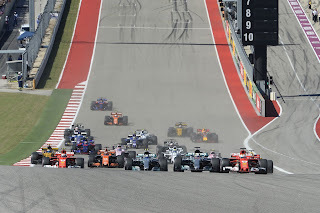 At the front, Raikkonen was beginning to reel in Ricciardo and Verstappen, continuing his ascent, rocked on by Ocon who, rather than endanger his 4 second cushion to Alonso, let the Red Bull by fairly unchallenged. Lap 11 and Stroll was in and out for a pair of Softs. Massa had gradually sunk down the order and was running P10, gradually losing time to Sainz just ahead. Ricciardo was in at the end of lap 13 after Raikkonen just about made it by the Red Bull, tyres done from his early combat with Bottas. Vettel, meanwhile, had receded to nearly 4 seconds adrift of Hamilton. And then it was over, Ricciardo pulled off lap 16 in the middle of the second sector with no engine. Crushing blow for the Aussie as confirmation from Hulkenberg it was an oil pressure issue responsible for his retirement. Under yellows into the pits went Vettel, end of lap 16, and out on Softs, P5 as the race resumed in earnest. Contra Sebastian, Hamilton was happy to extend the stint, increasing his tyre offset. The pitwall would be looking at laptimes though, as they would be nervous about keeping the freshly shod Vettel out of Hamilton's pit window. End of 18, in came Bottas as Lewis flashed serenely by. That wasn't going to last as Vettel was nearly 1.5 seconds faster than Lewis on his first full lap with his shiny new tyres. Indeed end of 19 and in came the leader. It was tight and as Lewis emerged on the softs, they were side by side, a bit of dicing before Lewis emptied the battery and put himself just ahead of Vettel. 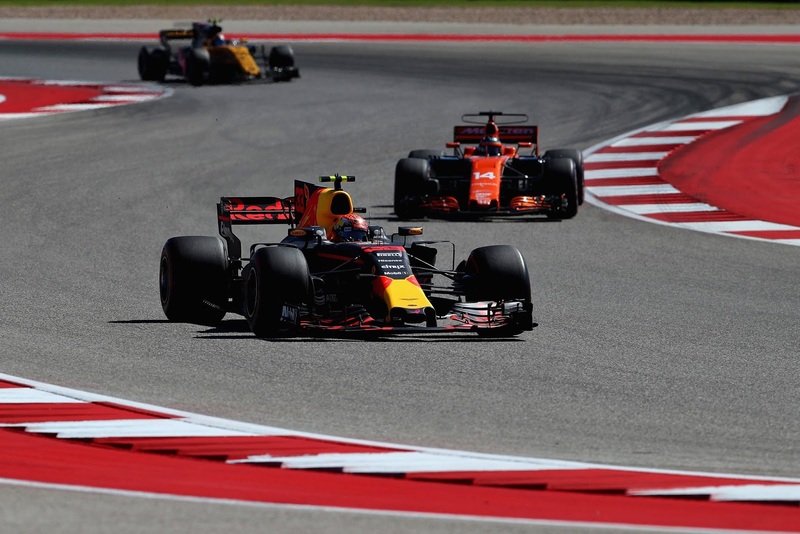 Sloppy exit of T20 robbed Vettel of a shot under DRS and as lap 21 headed for the books, it was Max Verstappen, on a set of Supers, cavorting about in the lead of the race as Raikkonen had bailed for a set of new tyres. At that moment, Verstappen's pit window looked back to P5, a huge gap between Raikkonen and Massa giving him ample room to drop back into. Lap 23 and Hamilton had caught up with the frolicking Verstappen, and with almost surgical precision, despatched the Dutchman, who put up a brave front as Lewis grabbed the cutback into T12 and kept the pressure on till Max was forced to yield. And then it was clear exactly how much the Red Bull was holding him back as Lewis went on to set fast lap the following go round, at the bottom of the 1:39's. Verstappen onto the Softs lap 25 as Alonso radioed in, quel surprise, an engine problem. Told to back off and pit, it looked to be curtains for the McLaren. In the thick of the midfield, it was Sainz, chasing Perez, who set a personal best and cut the gap down to less than 2 seconds. Massa, meanwhile, was losing chunks of time to Ocon, himself looking to keep Perez out of DRS. The 2 HAAS cars loitered just outside the points, with Grosjean on point, about 7 seconds behind the last points paying position, held by the Toro Rosso of Kvyat. Lap 29 and Ocon was well into DRS, 0.5 seconds off the tail of the eternally slowing Massa, who still had yet to pit and was driving Perez to moan yet again on the radio. Almost through the T12-T13-T14 complex Ocon was by with Perez penned in by team rules. And then Massa spoiled the fun by finally pitting at the end of lap 30. Released, Ocon was off to try and ditch his teammate whilst Massa was out in P12, surprisingly on a pair of Ultras as Williams generally not known for their gentle treatment of tyres. Vandoorne, who had pitted some laps ago, had managed to work his way by the Hartley/Stroll scrum as Perez pointed out to his team that Sainz was filling his mirrors and he had more pace. He was even perfectly happy to give the place back, he said, in a thoroughly believable fashion. The teams's reply was more forthright, Ocon was doing conservation and they needed the same from Perez. Outside T16 went Carlos, keeping the attack through T17 and T18, finally through T19 Sainz sealed the deal with a fantastic duel, at least for those who weren't Perez fans. Ocon took advantage to create a bit of a cushion, but freed from the threat of Perez, Sainz was slowly chewing through the gap. Verstappen continued to close in on Raikkonen, who was in the midst of trying to pick Bottas off under DRS. Just half a second separated them, but the Mercedes extra grunt out of the corners was keeping Bottas ahead for the moment, though at the rate he was locking up his tyres, sooner or later Raikkonen would have the advantage. Red Bull also brought Verstapppen in and back out on a set of Supers he went, 18 laps and 20 seconds. But it wasn't Raikkonen, but Vettel who answered, in and out with a set of Supers as well and less than a second ahead of the charging Dutchman. Raikkonen stayed out to continue to pressure Bottas and he sailed past the pit entrance, heedless of Verstappen behind on fresh tyres. Fast lap by Verstappen lap 41 nearly 2 seconds faster than Hamilton made this a dangerous choice indeed. Vettel responded with a personal best and joined young Max at the bottom of the 1:38's. That appeared to be more of a personal choice as the following lap Lewis purpled S1 and tasted the bottom of the 1:39's, as Vettel rolled well up into his pit window, the strategy battle poised to roll onto the end of the race. Raikkonen, meanwhile, had finally done the business on Bottas' tyres and swept by the defenseless Merc lap 42, launched into P2 with 13 laps to go and his team leader chasing ferociously. 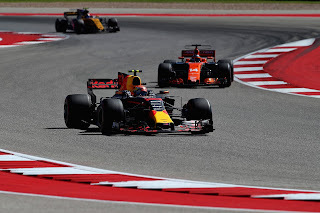 10 seconds to Bottas and 12 seconds to Kimi with 12 laps to go was the scene as Carlos Sainz had finally got to grips with Ocon, well into DRS and gradually ramping up the pressure. Lewis was starting to get a bit hinky on the radio, concerned about the gap to Raikkonen and the speed of Vettel. But the Maths argued otherwise, as Hamilton was 0.6 seconds faster than Raikonnen per lap and at 20 seconds, Vettel was well out of laps to catch the front running Mercedes, his gap per lap hovering around a second or less. Lap 46 and Grosjean was on the radio, worried about his tyre which he seemed to think he was out of rubber. Raikkonen meanwhile was entertainingly told to switch settings to save fuel, and he replied swearingly, saying the new settings made the car run bad and forcing his engineer to backtrack. Magnussen and Ericsson then had a bit of a coming together, lap 45, leaving some carbon fibre on the track as Ericsson took advantage of K-Mag having to let Vettel by, the HAAS punted into a spin as the finale to that pas de deux. Lap 49 and Ocon was putting paid to Perez' complaint, continuing to keep the Spaniard at bay. Vettel had rocked up to Bottas and was in DRS with 5 laps to go. The stewards, invogorated by the active pace of the race, meanwhile, had announced they were investigating the Ericsson-K-Mag incident. Vettel, outside Bottas T1 and into P3 with a beautiful move threading the needle between Bottas and Vandoorne, who was just about to be lapped. This left Verstappen in the catbird seat, as Valterri was desperate to struggle home with his tyres. As Verstappen relentlessly pursued Bottas, the stewards announced rather amazingly, that Ericsson was at fault in the incident with Magnussen. This puts Marcus into rare territory indeed, possibly the only driver in F1 who could manage to get himself penalised against Magnussen. Unlike Vettel, Verstappen made a bit of a hash of his attempt the following lap, Bottas locking up and going well into the run off. Verstappen yielded for the moment and into the following turns, easily took advantage and was by. This forced Mercedes to drag the Finn in for a set of Ultras, but far too little and late, the podium positions fast disappearing on the Texas horizon. Staggeringly, Vettel, with his foot in it, managed to catch the gas saving, old tyre running Raikkonen and get by him for P2, just in time for the final lap. A development that no one, absolutely no one saw coming. This put him into the wheelhouse of Verstappen, who was all over the gearbox of the tired Ferrari. The first go in Sector 1 was well defended by Raikkonen but going into the final complex, Max just shoved his way up the tiny gap left to the inside and as Hamilton crossed the line, the Red Bull took the final podium position by the horns (yes, I really did just do that) and that's how they crossed the line, with Raikkonen in a bitterly disappointed 4th, sacrificed yet again for Vettel's championship hopes. Further back, the impenetrable defense of Ocon had prevailed over the offense of Sainz, with Perez and his speed rocking in nearly 13 seconds adrift of the battling duo. And then, suddenly, it was not so over as the stewards announced that Verstappen had indeed, left the track and gained an advantage. Plus 5 seconds, and it was Raikkonen's podium after all. Of course, no difference at all for Bottas, who finished P5 after his uber late stop, and generally had a torrid time of it, Mercedes having bet on him being able to make the tyres last to the end, despite the plentiful evidence to the contrary that he was likely to struggle mightily to make that happen, unlike Lewis. Perez, Massa and Kvyat rounded out the points paying position, with Kvyat possibly gaining a reprieve to the end of the year on the back of his strong performance. Perez, on the other hand, has given away the game with his inability to defend against Sainz. Even less likely for him to be given a pass in the future, given Ocon's subsequent performance. Though one could accuse the wily junior of perhaps purposefully running Perez into the meatgrinder of Sainz. But the show was Mercedes, sending Allison to the podium as they took home the WCC. 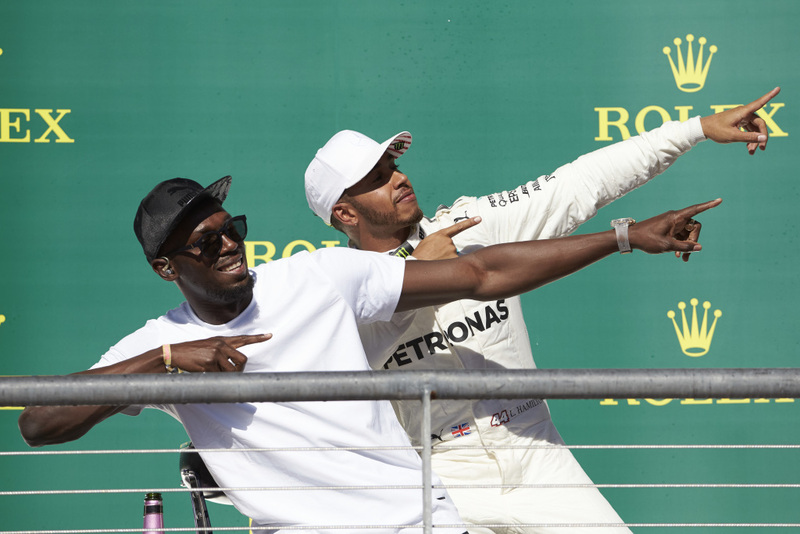 Usain Bolt conducted the podium interviews, but as brilliant as Vettel's drive was, Sainz' overtake of Perez had to put him into contention for move of the race, along with the crushing drive of Verstappen, penalty or no. P13 for Hartley, but at 31 seconds back of Kvyat, clearly a price to pay for being a total n00b in F1. The double podium a mild sop to Ferrari's ego after the disaster of the last 3 Grand Prixs, but the reality is without another race win in their pocket they have been well and truly beaten by Mercedes this season, even when Mercedes haven't had the best car at every race. But kudos indeed due Ferrari as well, for extending the season and providing proper battling at the front, after what seems 7 long years in the wilderness. And if the rumours about the supposed rake change for Mercedes come to pass, next season could be a corker indeed for the WCC. AS for the WDC, one inexorable step closer for Hamilton with his serene victory, with a chance to stick the knife in Vettel's hopes for good at the next Grand Prix. 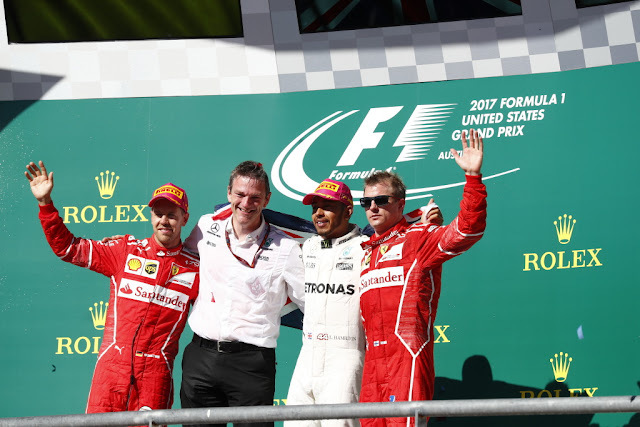 But Ferrari's chase for redemption will go all the way to the last lap turned in anger, regardless of the championship points.